For example, you need to send out an important message but it’s too early or too late in the day, so you tell yourself you’ll do it later — and forget. Now, with the right schedule maker for messages you will never again forget to send a message or feedback. This kind of app can help you easily schedule messages for the future and sending them to anyone at any time, very easily done. We looked and we have the right app to help you with this. Let’s see what the app is all about. What is Primler all about? With Primler as an interesting mode of communication app, users that want to protect their identity and set scheduled messages, sending them to specific people at a specific time, are able to share their privileged thoughts. Developed for android users, very easy for using and helpful this schedule maker for messages is allowing users to choose with who they want to share messages and when they want them to be sent. Users are constantly protected and safe when scheduling and sending messages, without the need to reveal their identity sending private views, thoughts and feedbacks to others. All the features offered on this schedule maker are high-quality, offering users to easily and instantly share feedbacks and thoughts with anyone at any time. On the app users can send their messages privately and the recipients of the messages can answer via web link or by using this app for message scheduling. Users on the app are offered to set hours, days, months or years on their scheduled messages or even to choose a specific date and time for any country time zone they like. One scheduled message can be sent to multiple recipients and the app is allowing users to even send attachments to the messages he scheduled. 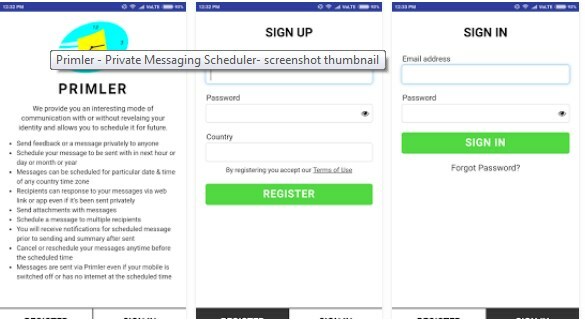 Each scheduled messages can be edited by the preference of users, the messages can be canceled or rescheduled before the scheduled time arrives. Users are getting notifications prior and after a message has be sent and each scheduled message will be sent even if the phone is off or has no Internet connection. Download it for free on Google Play now and message anyone without revealing your identity!